The new issue of 91 magazine is out. Inside there's an interview with Rosie Brown of online contemporary craft and design store Papa Stour plus a peep inside her lovely Scottish home (above). Also featured is ceramicist and textile designer Lise Meunier, whose Paris apartment (below) is a wonderfully eclectic treasure trove of found objects. Fashion's queen of minimalism - in a world where over-exposure is most often the story, Margaret Howell fiercely guards the quiet & very personal authenticity of her work. A quick and easy supper recipe for new season asparagus. How to look like a cream puff - Miss Moss's food & fashion mashup. Secondhand Rose: Suzanne Lipschutz on her passion for vintage wallpaper. An amazing apartment on the Rue de Rivoli in Paris. Can you weave from milk? Yes you can. Images: Top image Papa Stour. 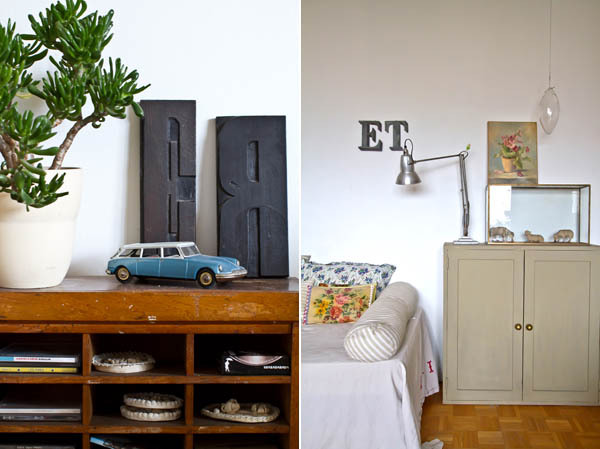 Images of Lise Meunier's home by Leigh Metcalf.